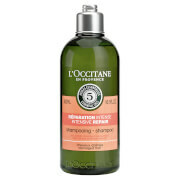 L'Occitane Aromachologie Repairing Shampoo smoothes and softens capillary fibers, leaving your hair looking and feeling supple, shiny and silky. A natural complex of 5 essential oils, including Angelica, Lavender, Geranium, Ylang-ylang and Patchouli, plus wheat proteins, work together in synergy to help repair, strengthen, regenerate and soften dry and damaged hair. The perfect shampoo for those who color treat, perm or thermostyle their hair. Leaves hair looking and feeling supple, shiny and silky. Repairs, strengthens and regenerates hair. Excellent for those with dry, damaged hair. Wet hair, apply shampoo, lather, rinse, then repeat. Leave on hair for one or two minutes, then rinse. Suitable for daily use. Water, Disodium Laureth Sulfosuccinate, Tea-Lauryl Sulfate, Laureth-2, Tilia PLatyphyllos Extract, Laurdimonoum Hydroxypropyl Hydrolyzed Wheat Protein, PEG-120 Methyl Glucose Dioleate, Sodium Chloride, Fragrance, PEG/PPG-14/4 Dimethicone, Coco-Glucoside, Glyceryl Oleate, PPG-26 Buteth-26, Panthenol, PEG-40 Hydrogenated Castor Oil, Polyquaternium-7, Polyquaternium-10, Limonene, Lavender Oil, Linalool, Angelica Archangelica Root Oil, Pelargnium Graveolens Flower Oil, Methylchloroisothiazolinone Methylisothiazolinone. Does this shampoo function with keratin Treatment? I smelt the product when it first arrived and I was very iffy about it. It smells like an old perfume mixed with baby powder. Vey strong and very unpleasant once I used it. It even overpowered my body perfume! 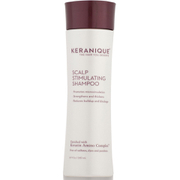 I have been using this shampoo since my hair grew back after chemotherapy. It has made my hair very healthy and soft. I love the aroma it is invigorating and pleasant. My hairdresser complitments me all the time on how healthy my hair is as it grows back. It is gentle and I just love it along with the L'Occitane conditioner. My hair has never felt so strong and healthy. I have very fine hair and it was damaged from styling and the weather. This product is a God-send! I absolutely LOVE it and will never be without it. I wasn't too sure the first time I used it, but the second time I fell in LOVE with it! Try it, it will repair your hair! I have been using this shampoo for a few weeks now. It is gentle and doesn't weigh down my thin color treated hair. My hair feels healthier and looks oh-so-silky-smooth! In addition, I love the smell of all the essential oils! Very invigorating and therapeutic! After giving birth and breastfeeding I started to have problems with my hair. My scalp was so irritated and shampoos just made it worse. This is the only shampoo that feels wonderful and makes my hair absolutely wonderful. Full, shiny and not oily. Was afraid due to several different oils added to this shampoo? but does not bother my oily hair and makes it much better.